As a first simple example of writing MineMeld nodes, let's write code a simple Miner. 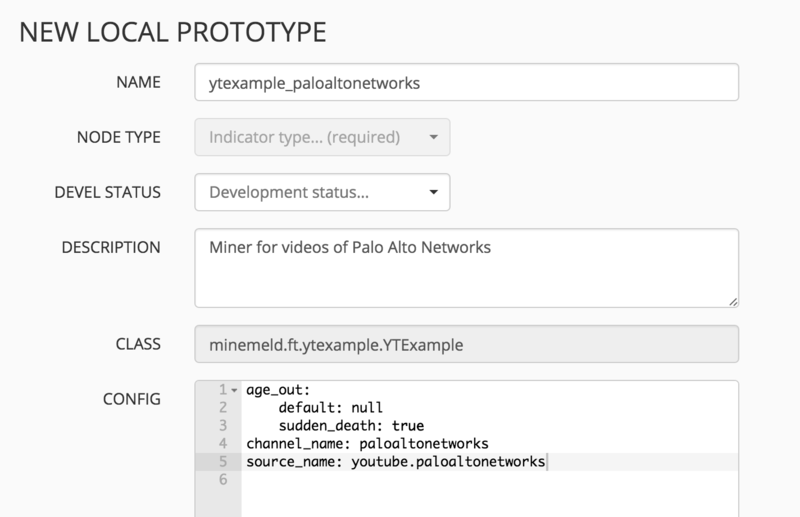 The idea behind the Miner that will be used in this example comes from a script of Carlito Vleia, a Systems Engineer at Palo Alto Networks. The idea is pretty simple: periodically retrieve the list of videos published in a specific YouTube channel and translate the entries in a set of indicators of type URL for the External Dynamic List feature of Palo Alto Networks PAN-OS. After all that reading, spin up a full MineMeld devel environment following the developer's guide. Let's start with writing the code for the new Miner. To make our life a bit easier, logic for 5, 6, 7 and most of 1 and 2 is already implemented in minemeld.ft.basepoller.BasePollerFT - this is the superclass used by most of the polling Miners. Our YouTube Miner should read the channel name from the config. This can be done inside the configure method. When called, the configuration is already stored as a dictionary in the self.config attribute of the instance. We also want to read from the config a polling timeout and a flag to control HTTPS certificate verification (default should be True). At every polling interval, the _build_iterator method is called with current time since epoch in millisec. The return should be an iterator yielding a list of items. Each item is then translated to a list of indicators using the _process_item method. The method _build_iterator returns a list of bs4.element.Tag objects. Each object is then passed by the base class to the _process_item method. This method is responsible for translating each object in a list of indicators. In our case the _process_item method creates an indicator of type URL for each object. If something fails the first place to look is the engine log file, /opt/minemeld/log/minemeld-engine.log. Congratulations ! Your new node is up and running ! To make it available to the CONFIG page on the UI you should now create a simple prototype for it.